In 1948, only 32% of women were in the official labor force, according to the Federal Reserve Bank of St. Louis. As of February 2018, that number had almost doubled to 57%. Today in some American cities, women are earning large salaries, running their own businesses and handling their mortgages with ease. 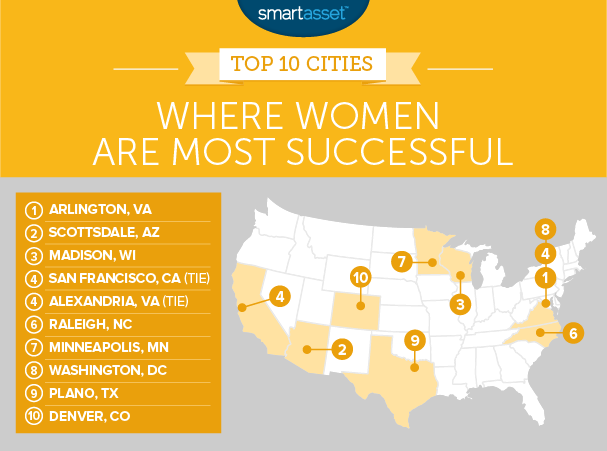 With this in mind, SmartAsset decided to find the U.S. cities where women are succeeding the most. In order to do this, we looked at data on six factors. Specifically we looked at percent of women with bachelor’s degrees, median earnings for full-time working women, percent of businesses owned by women, women’s unemployment rate, average housing cost as a percent of a full-time working woman’s income and percent of women with high incomes. Check out the data and methodology to see where we got our data and how we put it together. D.C. metro area scores well – Three cities within the D.C. metro area scored well. Arlington, Virginia, Alexandria, Virginia and Washington, D.C. all secured spots in our top 10. Women in these cities earn high salaries, pushing them up the rankings. Regional mix – No single region of the country dominated this list. Instead the Mid-Atlantic, the West Coast, the South, the Southwest and the Midwest are all represented in the top 10. Arlington, Virginia takes the top spot. This city has the highest paid women in the study, according to Census Bureau data. The median full-time working woman in Arlington earns over $80,200 per year. In total nearly 57% of women here earn at least $75,000 per year. And Arlington women do more than earn large paychecks. For one, they also make up 38.6% of people working in their own private businesses and just under 35% of women here have a bachelor’s degree. In fact, the only metric this city does not score in the top 10 for is housing cost as a percent of income. According to our data, if the average full-time working woman paid for the average home they would spend just around 30% of their income. Scottsdale, Arizona ranks a distant second. Overall Scottsdale comes in almost 12 points behind Arlington on the index. Full-time working women here earn $56,600 on average, a top 10 score. Furthermore only 3.5% of women here are unemployed. But where Scottsdale falls behind Arlington is in the business ownership rate. Only 25% of business owners here are women. It may be no surprise that Madison, Wisconsin, one of the top college towns in the nation, is full of successful women who have obtained their bachelor’s degree. According to our data, just under a third of all women here hold bachelor’s degrees. One metric that hurt Madison’s score is that working women here are slightly underpaid compared to women other cities in this top 10. Madison ranks 30th for median earnings for full-time working women and 29th for percent of women who earn at least $75,000 per year. San Francisco is known as a home for some of the country’s most successful people, especially those working in tech. Women are no exception. According to our data, full-time working women in San Francisco are paid nearly $72,000 on average, a figure only surpassed by women in Arlington. Just under 49% of full-time working women in SF earn at least $75,000. The cost of living in San Francisco hurts its overall score however. We estimate that the average full-time working woman here would be housing cost-burdened if she paid for the median home. Another city just outside of Washington, D.C. takes fourth. Like in Arlington, women in Alexandria are well paid. Our data shows the average full-time Alexandria working woman earns $67,000 per year. That is the fifth-highest amount in our study. The city also scores well in the higher education metric, with just under 30% of women having a bachelor’s degree. North Carolina’s capital takes sixth. Women here are well paid but on average do not earn as much as women in San Francisco or Arlington do. The average full-time working woman here earns just over $47,000 per year, 22nd-most in our study. However only 20% of full-time working women take home over $75,000 per year, the lowest percentage in our top 10. Where Raleigh gains ground on other cities is in local cost of living. Average housing costs here account for only 28% of the median full-time working woman’s income, a top 20 score. The western portion of the Twin Cities takes seventh. Relative to income, women in Minneapolis are spending some of the lowest amounts on housing. We estimate that in order to pay for the median home, the average full-time working woman would only need to spend 27% of her income. 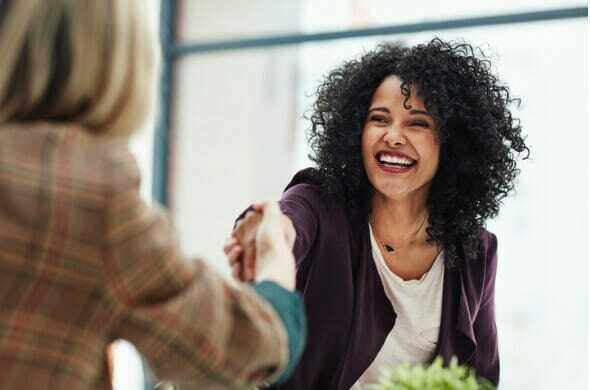 That leaves women here able to put more of their salary toward saving for retirement or investing their savings with a personal financial advisor. One area where Minneapolis could improve is in its women’s unemployment rate. According to our data, 5.1% of women between the ages of 20 to 64 who are actively looking for work don’t have jobs. Rounding out the Washington D.C. metro area’s strong showing in this top 10 is D.C. itself. For starters D.C. is an excellent place for women in tech. The nation’s capital is also home to a number of woman who own their own businesses. Women make up almost 40% of business owners, a top 5 score. The median earnings for full-time working women in D.C. is $65,060, the fifth-highest score in the country. One of the hardest-working cities in the country is also one where women are succeeding the most. Just over 27% of full-time working women in Plano earned at least $75,000, a top 15 rate. Working women here for the most part have had no trouble finding work either. According to our data, the women’s unemployment rate is only 3.1%. The city also has some of the most educated women in the study, with just under 36% of women holding bachelor’s degrees. However, our data shows that the average home costs over $1,400 per month, including mortgage and property taxes, which would eat up 33% of the average full-time working women’s income. For that metric, Plano ranks in the bottom half. Our top 10 finishes in Denver. The Mile-High City ranks well in income metrics. This city ranks 16th for average earnings for full-time working women and 23rd for percent of full-time working women who earn at least $75,000. It also ranks 15th for percent of women who have bachelor’s degrees. Denver ends up in 10th because of the low percentage of women who own businesses and high local housing costs. 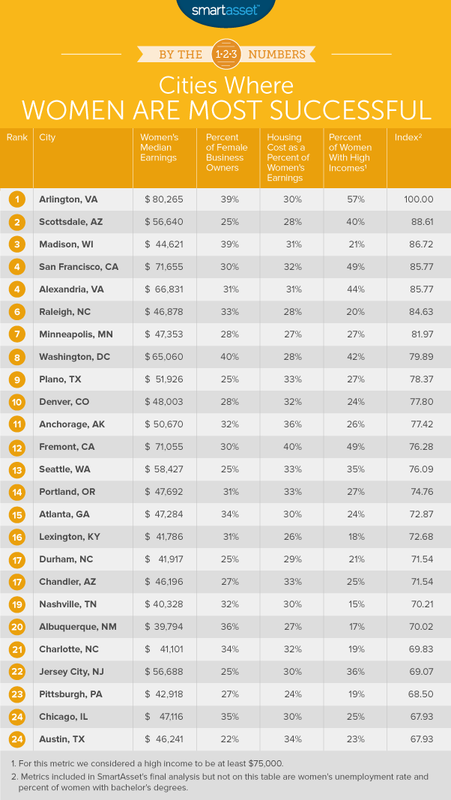 For both of those metrics, Denver ranks below-average. Percent of women with a bachelor’s degree. This is the percent of women above the age of 25 who have bachelor’s degrees. Median earnings for full-time working women. This is median earnings for women who work full time. Percent of business owners who are women. This is the percent of self-employed people working in their own incorporated business who are women. Unemployment rate for women. This is the unemployment rate for women between the ages of 25-64. Housing cost as a percent of earnings for full-time working women. This is median annual housing costs divided by median earnings for full-time working women. Percent of full-time working women with earnings of at least $75,000. This is the percent of full-time working women who earn at least $75,000 per year. Data for all metrics comes from the Census Bureau’s 2016 1-year American Community Survey. First we ranked all cities in each metric and then we found the average ranking for each city, giving equal weighting to each metric. Using the average ranking, we created our final index. The city with the highest average ranking received a 100 and the city with the lowest received a 0. Save up for a down payment. Typically, experts recommend a down payment of at least 20%. Some mortgage lenders will allow you to put less down but then you will likely have to get private mortgage insurance, which will drive up your overall mortgage costs. It’s a better idea to have saved the full 20% down payment before you start the home-buying process. Consider meeting with a financial professional to make sure you have enough saved up to buy the house you want. Be aware of extra costs. When deciding how much house you can afford, the home price is the largest component but don’t forget about extras like closing costs, property taxes and homeowners insurance. Those are all costs that add up and could be the difference between you buying a home you can afford and buying a home you can’t afford. Don’t get locked into a losing negotiation. If you find negotiations over a home price veering into unaffordable territory, it may be time to cut your losses and look for a different home. It is not worth buying your dream home if after a few mortgage payments, you find that it’s unaffordable.